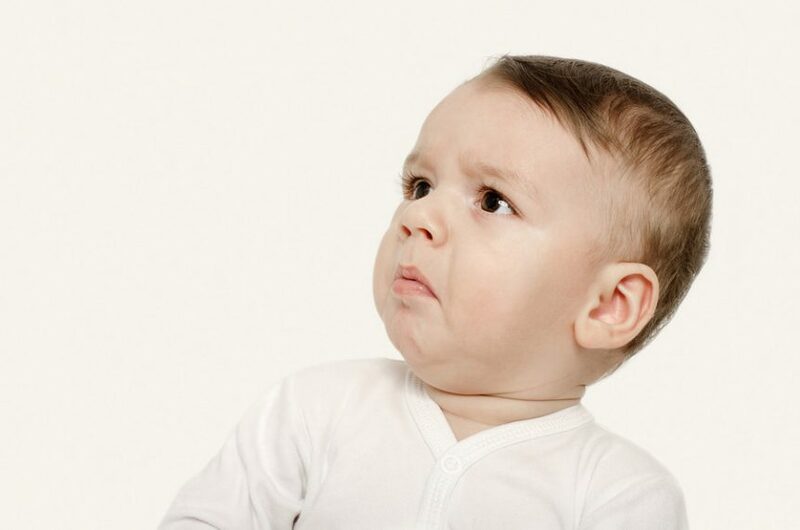 Fun Fact Fridays Spit in a Baby’s Face… It’s Good Luck! Spit in a Baby’s Face… It’s Good Luck! In Nigeria, there is a tribe called the Igbo. When an Igbo baby is born and begins crying, it is carried to the family’s ancestral home. Whilst there, a family member known to be a good orator will chew some alligator pepper, spit it onto a finger, and put it into the baby’s mouth. The tradition states that the child will grow up to be as good an orator as the donor! Greeks are known to spit to chase evil spirits away. The most common is to ward off the evil eye. The evil eye is thought to steal away anybody and anything that is praised or admired by people. Thus, spitting on your baby helps protect it by making it appear undesirable to the evil spirits and less likely to be taken. The tradition is still practised, but people are more likely to pretend to spit than to actually do so! The Bulgarian tradition is very similar to the Greek, to ward off the evil eye. Probably of no surprise as they share a large land border. In addition to pretending to spit on babies, they will accompany it with the phrase “may chickens poop on you” or similar to make the child appear less desirable to the evil spirits. The Massai, a tribe found in both Kenya and Tanzania, have customs that include spitting. One of these customs is that the men spit to greet each other and it’s because of this greeting that babies get a face full of saliva upon birth. Then to add insult to injury they also refer to the newborn as bad! The belief behind this name calling is that if a baby is praised, then it is cursed. The name calling is therefore, to protect the baby from evil spirits. In Mauritania there is a tribe called the Wolof, where the elder women will spit on the face of newborns and kiss it as a blessing – to protect the child from evil. Similarly, the elder men will spit in the newborn’s ears and rub their saliva all over the babies head. The explanation behind this lies in the belief that saliva has the power to retain words such as blessings. It is stated that ‘Like honey in water, speech, good or bad, dissolves in saliva which retains part of its power’. That’s a great point! Thanks for sharing Paul. That reminds me of something similar… How you can use a family milking cow to bolster immunity. Family members would all spit into the feed of the family cow. The cow would then create antibodies to help fight any found infections or pathogens, that would then be present in their milk for the family to drink. 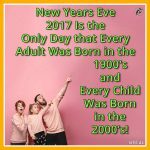 New Years Eve 2017 Is the Only Day that Every Adult Was Born in the 1900’s and Every Child Was Born in the 2000’s! 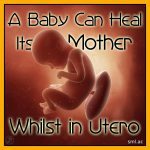 A Baby Can Heal Its Mother Whilst in Utero! Twins Can Be Born in Different Years, One Set Was Born 87 Days Apart! 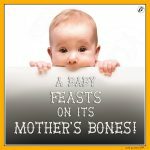 A Baby Feasts on Its Mother’s Bones! “The Mask of Pregnancy” Is Caused by Melanin! 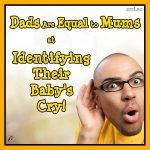 Dads Are Equal to Mums at Identifying Their Baby’s Cry! 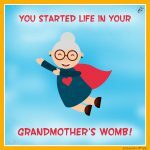 You Started Life in Your Grandmother’s Womb!